Attention today shall be paid to the data on industrial output in Eurozone, the volume of which is expected to increase. In addition, the speech of Mr Kocherlakota, a member of the US Open Market Committee can have impact on the movement in the pair. Tomorrow, key indices of Germany and France will become known and monthly economic report of ECB will be published. 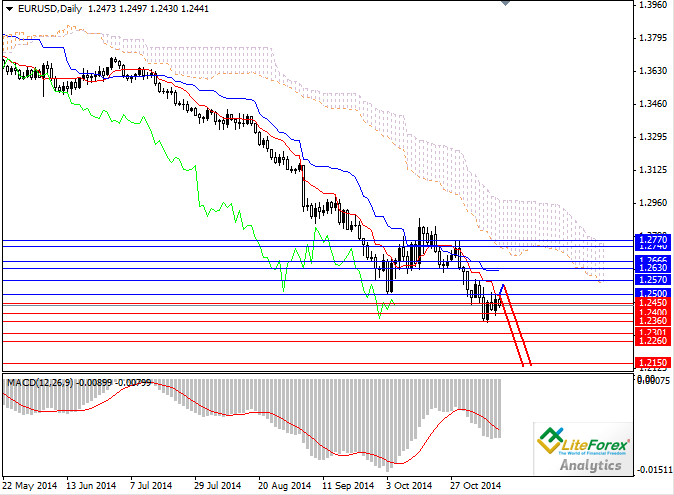 Poor data on industrial output in Eurozone can drop the pair to the local lows and the key support level of 1.2360. If European statistics continues to be negative and demand for the Euro decreases, the pair can fall to the lows of July 2012 at the level of 1.2040. Euro needs strong drivers in order to regain. Support levels: 1.2450, 1.2400, 1.2360, 1.2300, 1.2260, 1.2150 and 1.2040. Resistance levels: 1.2500, 1.2570, 1.2630, 1.2660, 1.2740 and 1.2770. It makes sense to continue trading on the trend, placing pending sell orders from the levels of 1.2500 and 1.2570 and take profit at the level of 1.2360, and in the medium-term: at the level of 1.2040. In addition, it is advisable to open long positions from the strong support level and the local lows of the year 2012 with the short stop-loss.